"One Stop" solution for all your writing concern!! 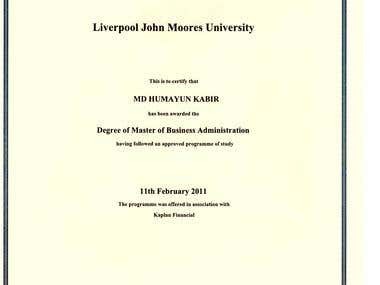 Hi, Welcome to my profile :) I am a Graduate from Liverpool John Moores University, United Kingdom. I have done Post graduate Diploma from Edexcel, UK.I am a pharmacist & lived in London for 10 years. Conducting research & Writing is my passion, I love to write on any topics as I have both Science and Business (Graduation) background. -I like challenges towards any short deadlines. -Specialized on Thesis and Dissertation format writing! -I have Vast experiences of Academic & Business writing since 2008, with the UK & USA English background. -I do use all the upgraded tools like SPSS software for Data analysis to find out accurate results for the research. -I am experienced on MLA, APA, MHRA & HARVARD referencing style. BELOW...CHECK MY REVIEWS PLS!!!!! Organising and Managing Team, Looking after and making sure Quality of writing. I was one of the directors of the company. As a part of the career promotion steps. Got this short Diploma Certificate on Leadership and shift running. About how to deal with conflict in the work place. Market research about pharmaceutical marketing and its related ethics!! How mindfulness can be useful for student and their business career. How motivation can increase employee performance within UK businesses.